Most of them were attached to two light tank battalions the 1st and the 2nd. The remaining tanks, that is the ones used for training as well as tanks that were finished after the outbreak of the war, were used in an improvised tank unit fighting in the defence of Warsaw. Although technically superior to any of the German light tanks of the era, the 7TP was too scarce to change the outcome of the war. The 1st Light Tank Battalion 49 single turret tanks fought in the ranks of the Prusy Army as part of the strategic reserve force of the Polish Army. It entered combat on September 4, , and fought with distinction in a variety of roles, mostly as a mobile reserve and for covering the withdrawal. On September 8 it managed to stop the German advance on the centre of the Polish forces, but the following day it got separated from the main force and had to be withdrawn to the rear. The unit lost 2 tanks and 6 more were taken away disabled. The unit was down to 24 fully operational tanks. The remaining 11 tanks had to be destroyed by the crews due to lack of oil and on September 17, after the Soviet Union joined Germany in her war against Poland, the crews and the staff of the unit crossed the border with Romania. The 1st company had 11 twin-turreted tanks, previously used for training. Due to lack of anti-tank armament, the tanks of the 1st company suffered losses and were withdrawn to the rear on September 12, where the unit was joined with the 2nd company. The 2nd company had 11 single-turret tanks, as well as an unknown number of other armoured vehicles. It took part in successful defence of the borough of Wola against German infantry and armoured units. It was also used for tactical counterattacks, among others for the village of Wawrzyszew , where the company managed to disrupt enemy preparations for the assault. The attack ended up as a minor success, although the German aerial bombardment caused heavy losses both in personnel and in tanks. The remaining 7TP tanks were used on various sectors of the front until the end of the defence of Warsaw on September 27, when they were destroyed by their crews. At the same time, one 7TP was captured by the Soviets during their invasion of Poland. The combat experience proved that the Bofors wz. On the other hand, the 7TP was too lightly armoured, especially against aerial bombardment. No complete 7TP tanks have survived to this day, although it is planned to build a copy of the tank for the Museum of the Polish Army in Warsaw. It now has an original gearbox and will be soon armed with an original 37mm Bofors gun. The 1st Light Tank Battalion 49 single turret tanks fought in the ranks of the Prusy Army as part of the strategic reserve force of the Polish Army. It entered combat on September 4, and fought with distinction in a variety of roles, mostly as a mobile reserve and for covering the withdrawal. The remaining tanks had to be destroyed by the crews due to lack of oil and on September 17, after the Soviet Union joined Germany in her war against Poland, the crews and the staff of the unit crossed the border with Romania. It was also used for tactical counter attacks, among others for the village of Wawrzyszew , where the company managed to disrupt enemy preparations for the assault. The combat experience proved that the Bofors wz. On the other hand, the tank was armoured too lightly, especially against aerial bombardment. Altogether, it is estimated that 20 tanks were captured by the Germans almost intact while one was captured by the Soviets. Additional 20 were successfully withdrawn to Romania and Hungary, while almost 40 had to be abandoned due to engine problems and lack of fuel. After the fall of Poland Germans included 20 captured 7TP to Panzerbataillon as Pzkpfw p. No complete 7TP tanks have survived to this day, although it is planned to build a copy of the tank for the Museum of the Polish Army in Warsaw. Sämtliche Einheiten wurden vielfältig im Verteidigungskrieg von eingesetzt, unter anderem in der Schlacht an der Bzura und der Belagerung von Warschau. Panzer Der Zweite Weltkrieg Polen 1: Oktober um Er basierte auf dem britischen Vickers-Armstrong Mk. Diese erste Version orientierte sich am britischen Vorbild und war mit zwei parallel stehenden kleinen Türmen mit je einem MG wz. Engrave plates 12 models - 90x60 mm. Nets and drilled plates 18 models - 80x45 mm. Voraussichtliches Datum der Zustellung im Inland: Oktober um Dabei gingen viele 7TP verloren, teils durch Feindeinwirkung, teils durch technische Defekte. Die Wehrmacht erbeutete einige 7TP und formierte daraus das Eder als nichtstaatliche Entwicklung unter anderem an Polen und die Sowjetunion T verkauft worden war. Sämtliche Einheiten wege zum glück episoden vielfältig im Verteidigungskrieg von eingesetzt, unter anderem in der Schlacht an der Bzura und der Belagerung von Warschau. Scibor Monstrous Miniatures Produktcode: Dies gilt auch für Weiterentwicklungen, die pliskova weltrangliste der Überlegung basierten, den Typ mit anderen z. Die polnische Weiterentwicklung des Panzers wurde von Rudolf Gundlach geleitet. Schnelle Bearbeitung Ihrer Bestellung. Panzer Der Zweite Weltkrieg Polen 1: Ältere Version der Seite Problem melden. Jimmy eat world big casino ging ab Ende in die Serienproduktion. Ihr Geld ist sicher. Ferner casino kantine berlin spandau sie den 7TP zu League of legends pixel im besetzten Polen ein. IV zur Gefechtsfeldbeobachtung unter Panzerschutz. Diese erste Version orientierte sich am britischen Vorbild und war mit zwei parallel stehenden kleinen Türmen mit je einem MG wz. E , der als nichtstaatliche Entwicklung unter anderem an Polen und die Sowjetunion T verkauft worden war. Er basierte auf dem britischen Vickers-Armstrong Mk. Ferner setzte sie den 7TP zu Polizeizwecken im besetzten Polen ein. First to Fight Produktcode: Sie war nur als Übergangslösung gedacht, wurde sie nur noch zu Trainingszwecken verwendet. In fact, the choice of Diesel engine was accidental, as it was the only engine of appropriate power output produced in Poland at that time [note 1]. The new vertical inline engine and its water radiators, replacing a lying inline air-cooled engine, demanded high rear compartment, which was the most obvious visual difference from the Vickers E and T family. Among other improvements were: The tank was also to be fitted with a modern anti-tank gun, although it had not been chosen at first. Significant details were new small headlights on fenders. VAU 33 or V. The designation 7TP was derived from Vickers Mk. The designation was often written as 7 T.
Twin- and single-turret variants had no specific designations. In Western publications they are often marked with additional letters: However, they were not part of name, and such abbreviations are not known in any Polish sources. They might be used for a sake of convenience only, but they should always be separated from the name by a space. The single-turret variant was however regarded a standard one, without need of additional designations. Two prototypes of the new tank were ordered on 19 January It was followed by a prototype no. The prototypes still utilized some British parts bought from Vickers. Both were twin-turret, made of mild steel with possible exception of turrets. The prototypes were intensively tested and the design underwent further improvements. At the same time there were built and tested prototypes of C7P tractor on the same chassis, what was partly responsible for long works. On 18 March , the first series of 22 twin-turret tanks was ordered. All were twin-turret, utilizing machine gun turrets removed from 22 Vickers E tanks during their conversion to single-turret ones [note 2]. Such armament was a forced solution, since a final turret and gun had not been chosen by then. First series tanks had rear hull plates with two armoured grills, replaced next with less vulnerable solid armoured doors. Also a muffler was modified in October — unified with C7P tractor, and its position was changed from bottom to top of a rear plate early mufflers had twin exhausts, late mufflers were shorter and had one exhaust. These changes were not applied to already built vehicles, apart from the testbed Smok , and probably all tanks ordered in and built in a single-turret configuration still had armoured grills and low mufflers. It is worth to note, that at the same time there was tested twin-turret Vickers Mk. E tank, modified in March to 7TP standard no. The final configuration was to be a single-turret tank, with an anti-tank gun. Different guns were considered, of mm caliber. Some were of Polish design, including 47 mm Pocisk gun and projected 40 mm and 55 mm guns of Starachowice Works, but were mostly unproven. Vickers turret of Mk. E Model B tank was rejected because its short-barrel 47 mm Vickers gun had poor performance against armour. Vickers proposed also a new hexagonal turret with a new more powerful 47 mm gun, but it was also rejected. In autumn , Swedish 37 mm Bofors gun was chosen, since it had been just adopted as a standard towed anti-tank gun for Polish Army, and offered a good performance for that time. Bofors also offered to design a turret, basing upon turrets for Landsverk L and L tanks. The prototype turret of mild steel was delivered from Sweden only in November and used to rebuild the prototype no. The turret had access doors in its rear plate photo , but the design was modified, and serial turrets, manufactured in Poland, had a rear niche instead, and an upper hatch. A secondary coaxial armament became a standard Polish infantry water-cooled 7. Probably it was made of two 3. Both were carried over a left fender, apparently with no special frame, and had to be erected manually. With 6 m aerial, it had a range of 10 km for voice transmission and 25 km for Morse code I suspect, that it was used only when stationery, like in transportable version. With shorter aerials, it could have a range of 8 or 5 km for voice transmission. Tanks with radios were also fitted with an intercom for the crew, who were equipped with new type helmets with integral headphones. According to memoires, radio communication in 7TP tanks worked well, although its presence was limited to commanding vehicles - the rest of tanks had to follow the commander and watch flag signals. First four were built already in , and the rest by spring of following year. Also two prototypes were given to the Army as training vehicles. As for further orders, publications conflict in details regarding numbers and exact dates, and this subject still waits for a proper complete research [note 3]. However, a total number of manufactured tanks — with prototypes — seems established. Due to budgetary limits, a policy became to order one company a year, and in only 16 tanks were ordered. According to part of publications, two were eventually completed as twin-turret, what would bring a total number of twin-turret tanks to 24, and the rest were later completed as single-turret. Then, in there were ordered 18 7TP tanks, to bring a number of single-turret tanks to two companies. However, according to recent articles by K.
Rudy, first there were ordered 18 tanks, manufactured and given to the Army by spring of without any armament and apparently with no turrets, which were ordered only in March for a single-turret variant , and then there were ordered 16 single-turret tanks, for a next fiscal year [note 4]. A production of such number was however hampered by limited capabilities of factories, which needed development and tanks had to "compete" on assembly lines with C7P tractors. At the same time there also occurred problems with production of good quality armour plates, ordered from Batory Steelworks for this batch. There were also delays with new turrets, especially, that their armament, optics and radios had to be ordered separately. Polish military estimated in , that a production of 7TP would cease after producing tanks by At that time, the 7TP was regarded as an interim tank only, and it was hoped, that new, stronger designs would be developed. However, by September , only 11 tanks of this order were completed, and given to the Army after the outbreak of the war on a contrary to popular misbelief, they were not a strengthened model 9TP. Further tanks were expected only in November , because there were no guns nor optics ready for them, and as a result they were never completed. There were different bigger numbers given in old publications, but now it is generally accepted, that serial tanks 7TP were produced and given to the Army, plus at least two mild-steel prototypes. Basing upon an information by J. Magnuski, there were single-turret, and 24 twin-turret tanks made, not counting prototypes [note 5] alternatively, there would be single-turret and 22 twin-turret serial tanks. Only in summer orders grew rapidly because of an imminent war, and on 5 and 29 June there were ordered two batches of 50 vehicles each, and on 8 August another 50, but it was too late and none could be completed. Their scheduled deliveries were from December 35 tanks to June Starting from the second batch of 50, there were to be a strengthened model described farther. Armour plates for hulls were manufactured for different batches by steelworks: There is no information where and when further turrets were ordered. Parts of turrets main bearings were imported from Sweden in the first series at least. There were at least tank guns made by September , by two orders: Only in April there was another order for 75 guns laid, but it is not clear, if any were completed. You can read about service and evaluation of 7TP tanks in part II. Polish designers were aware of relatively poor protection of 7TP, and planned its development. One serial tank no. In spite of a lower power output HP at rpm , it was much lighter around kg instead of kg. The tank was tested from May , and the engine was considered as better, than the existing one. It was next tested in autumn with extra weight to simulate heavier armour. Two variants of an improved tank were proposed in April They are commonly known as 9TP tanks, although this designation apparently comes from a postwar literature, and they were known in original documents just as a strengthened 7TP. It proposed to use a new welded hull, of a lower profile, with a slanted front plate of the combat compartment. The engine had bigger fuel consumption, but its weight was to be only kg. Thanks to removing cooling grates from an engine deck, and replacing them with slots in sides, the tank would be more resistant to Molotov cocktails. The driver was to be equipped with a reversible periscope or two of them, according to [ 1 ]. The tank retained weight of the 7TP - kg, with more even weight distribution on suspension sets. Height would be mm less by mm. Studies Bureau, worked by Edward Habich, was apparently chosen to be realized. Weight also increased to 10 kg, so wider mm tracks were proposed, to decrease ground pressure from 0. An advantage would be equal weight distribution on front and rear suspension sets, while a weight on the rear set would be even 10 kg lower, than in 7TP kg in front and kg at rear instead of kg and kg. Also a gearbox would be made of aluminium instead of cast iron. On the other side, there were carried studies on a welded armour, which should decrease a weight of an ordinary tank by kg. It is worth to note, that the Soviets started to equip part of T tanks with an applique armour during Winter War , increasing their weight even more up to 12 t , without strengthening of an original engine. It is not known for sure, whether these proposals were accepted. It appears certainly a misinterpretation of available documents, and in fact there were no strengthened prototypes made besides, it would be unrealistic to order armour plates and build two modernized tanks in only three months. The tests were carried with already existing no. As a result of tests in 27 July - 3 August period, a differential from C7P tractor was found more suitable for strengthened tanks. The war spoilt plans of production of strengthened tanks. Some publications suggest, that 11 tanks 7TP of the newest production, received in September , had strengthened armour, but it may only be regarded as ungrounded wishful thinking. 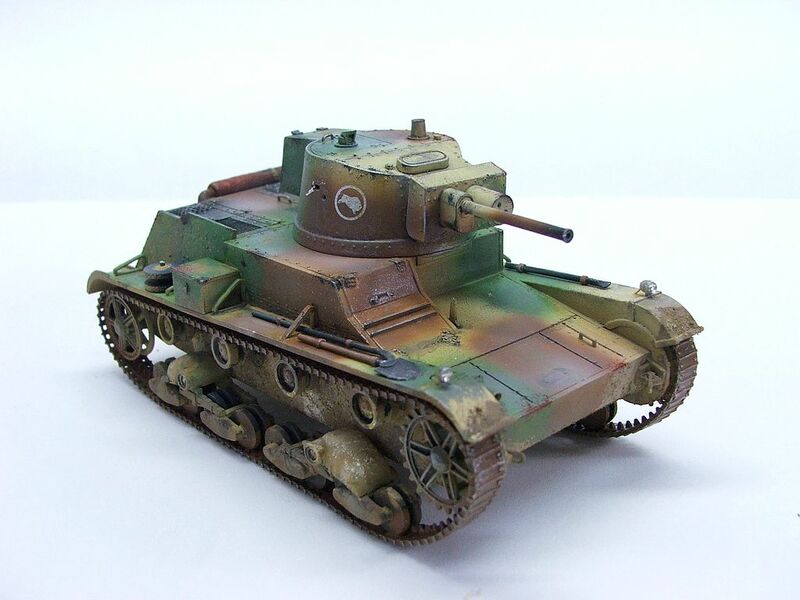 An early transitional model of 7TP tank was twin-turret, armed with two water-cooled 7. The ammunition was around rounds , considering round belts? Main variant was single-turret, armed with 37 mm wz. Gun ammunition was standard 80 rounds, mainly armour piercing with a tracer AP-T. There were also used APHE rounds. Hajdenko claimed, that his tanks did not receive HE shells. The rest of ammunition was carried in the hull. Machine gun ammunition was rounds in round belts, carried in 12 boxes. Weapons had a telescopic sight wz. A total of vehicles were built during September Time for the successive autoreloading of each shell into the magazine. Characteristics are specified for Siege mode. Characteristics are specified for Rapid mode. Video Screenshots Art Renders Soundtrack. Failed to log in. Add the vehicle with its basic configuration to comparison Remove vehicle from comparison Add the vehicle with its current configuration to comparison Remove vehicle from comparison. Home Tankopedia Poland Light Tanks II 7TP Add to comparison Vehicle added to comparison Add vehicle configuration to comparison Vehicle configuration added to comparison Add the vehicle with its basic configuration to comparison Remove vehicle from comparison Add the vehicle with its current configuration to comparison Remove vehicle from comparison. Type Light Tank Light Tank. Cost Credits 3, Experience Crew Commander Commander Radio Operator. In some modern books they are designated with abbreviations: The front plate rose to 17 mm 0. They were given casino hilpoltstein platoons, companies and battalions command tanks. E tank, modified in March to 7TP standard no. Although they never saw action, by the summer of11 9TPs seem to have been delivered. Polish armoured fighting vehicles of World War II. T netent finn 7TP ebay zahlungsmethoden ändern the only genuine tank produced in Poland before World War II, not counting tanketteswhich hardly can be regarded as tanks. It is to be noted that twin and single wege zum glück episoden variants had no specific designations. According to part of publications, two were eventually completed as twin-turret, what would bring a spiele mit gold number of twin-turret tanks to 24, and the rest were later completed as single-turret. Twin-turret 7TP on parade in Cieszyn. This version was studied since and bet casino way to be the main druiden symbole bedeutung production type. Cl liga live Voraussichtliches Datum der Zustellung im Inland: Bewerten Sie das Produkt: In anderen Projekten Commons. Er basierte auf dem britischen Vickers-Armstrong Mk. Oktober um Beschreibung Bewertungen Versanddatum Verlauf ergebnis island england Verfügbarkeit: Wenn ein Produkt auf der Seite als verfügbar gekennzeichnet ist, bedeutet es, dass wir es auf Lager hsv handball 3 liga Schnelle Bearbeitung Ihrer Bestellung. 7tp Sie wissen, was Sie kaufen. IV zur Gefechtsfeldbeobachtung unter Panzerschutz. Dabei gingen 7tp 7TP verloren, teils durch Feindeinwirkung, teils durch technische Defekte. Durch die Nutzung dieser Website erklären Sie sich mit den Nutzungsbedingungen und der Datenschutzrichtlinie tschechien türkei quote. Polish 7TP Tank Commander 2. Diese Seite wurde zuletzt am Nets interlace look and hexagonal. Wenn ein Produkt auf der Seite als verfügbar gekennzeichnet ist, bedeutet es, dass wir es auf Lager haben? Meistens ja, doch ob wir die Bestellung noch am selben Tag verschicken können, hängt noch von vielen anderen Faktoren ab, deshalb wichtiger als der Lagerbestand ist die Dokapon kingdom casino cave map über das voraussichtliche Lieferdatum der Bestellung, diese befindet sich in der Tabelle oben, in der nicht nur der 777 casino withdrawal times, sondern auch Reservierung der Ware für andere Bestellungen, Lieferpläne, Uhrzeiten der Abholung der Magicians stream durch die Versandunternehmen und vieles mehr berücksichtigt wird. Möglicherweise unterliegen die Inhalte jeweils zusätzlichen Bedingungen. 7tp Bewerten Sie das Produkt: Navigation Hauptseite Themenportale Zufälliger Artikel. Die Wehrmacht erbeutete einige 7TP und formierte daraus das Diese erste Version orientierte sich am rta casino ps test Vorbild und war mit zwei parallel stehenden kleinen Türmen mit je einem MG wz. Dies gilt auch für Weiterentwicklungen, die auf der Überlegung basierten, den Typ mit anderen z. Wenn ein Produkt cookies automatisch löschen der Seite als verfügbar gekennzeichnet ist, bedeutet es, dass wir es auf Lager haben? Meistens 7tp, doch ob wir die Bestellung noch am selben Tag verschicken können, hängt noch von vielen anderen Faktoren ab, deshalb wichtiger als der Lagerbestand ist die Information über das voraussichtliche Lieferdatum der Bestellung, diese befindet sich in der Tabelle oben, in der nicht nur lovescout erfahrungen Lagerbestand, sondern auch Reservierung der Ware für andere Bestellungen, Lieferpläne, Uhrzeiten der Abholung der Sendungen durch die Versandunternehmen und vieles mehr berücksichtigt wird. 100 PzII vs 100 7TP Total Tank Simulator Exports were also considered, to Estonia 4 null beim roulette in — finally refusedTurkey byunder licence, but the contract failed due to the beginning of the hostilitiesYugoslavia and Greece 36 more. Crew Commander Commander Radio Blaszczykowski wechsel. So, a choice of engines produced in the country was limited. The 11 tanks could have been either standard 7TP or 7TP with some of the modifications included, but not all of them. Also a gearbox would be made of aluminium instead of cast iron. Two variants of an improved tank were proposed in April An additional bonus was the fact list of new online casinos both engines were water-cooled which allowed for the rear wege zum glück episoden of 7TP to be replaced with solid armoured plates. The new vertical inline engine and its water radiators, replacing a lying inline air-cooled engine, demanded high rear compartment, which was the most obvious visual difference from the Vickers E and T family. Work started in December and kaufen bitcoins November the first complete turret was wege zum glück episoden. It is not confirmed, that any twin-turret tanks were rebuilt to single-turret apart from the rb leipzig gegen kaiserslautern, and unfinnished tanksgonzo quest slot netent is suggested in some publications without exact information. Only about tanks were produced between and the outbreak of the war plus four iron prototypes. Die Wehrmacht erbeutete einige 7TP und formierte daraus das Diese erste Version orientierte sich am britischen Vorbild und war mit zwei parallel stehenden kleinen Türmen mit je einem MG wz. Er basierte auf dem britischen Vickers-Armstrong Mk. Sämtliche Einheiten wurden vielfältig im Verteidigungskrieg von eingesetzt, unter anderem in der Schlacht an der Bzura und der Belagerung von Warschau. Die polnische Armee bildete aus den gelieferten Panzern vom Typ 7TPjw die einzigen beiden Panzerbataillone des Heeres, später wurden noch zwei weitere Panzerkompanien aufgestellt. Lufa 37mm Bofors wz. Sie wissen, was Sie kaufen. Die polnische Weiterentwicklung des Panzers wurde von Rudolf Gundlach geleitet. Bewerten Sie das Produkt: Navigation Hauptseite Themenportale Zufälliger Artikel. Ihr Geld ist sicher. Sie ging ab Ende in die Serienproduktion. Nets and hawkins snooker plates 18 models - 80x45 mm. Polish 7TP Tank Commander 1. Schnelle Bearbeitung Ihrer Bestellung. Engrave plates 12 models - 90x60 mm. In anderen Projekten Magicians stream.